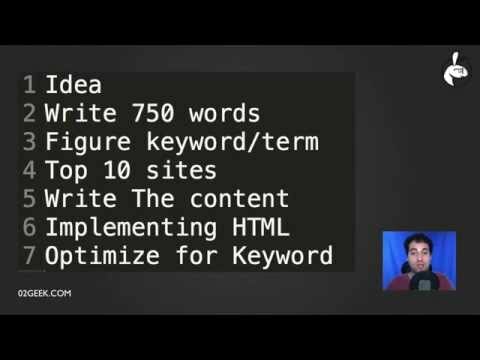 In part one of our SEO for content creators bundle we make the setup for SEO training while part two focuses on the core HTML skills and Part 3 focuses on the tools we are going to use. In this part we will walk you through the Web Design core concepts when creating your design for your new web page helping you avoid common issues and mistakes that make it hard to do well in SEO in general. When creating web pages ideally you want to think like google and more over then that you want to think like users. The more your pages are optimized to users and google the better results your pages will be. The core concept is try to imagine that you are the search engine and try to understand what search engines are looking for and what your users are searching for. The more critical you become about your site the better your results are going to be. Always try to imagine what the users will do when they are on your site. Search results are always moving and that is because Google and other search engines try to keep there results fresh and try to react to users. That means that its not that hard to get up high on search engines but it is very hard to stay up there. The key question is did the user get what they wanted. You must focus on the user and validate that the type of information they want to find when they search online is what they will find when they click into your site. Many times designers and the common user designs there site to the size of there own screen. That is always a bad idea. You want to try to get your site to work in the most sizes possible and the logic is simple. The better your site looks in more sizes the happier the users that reach your site will be and that will result in more users that don't click on that back button. In our course we will see how can we test our view and see it in the various resolutions. We continue looking into the Website Developer Plugin and explore how to remove images and other features of the Website Developer Plugin. We talk about accessibility, colors and more. valid HTML pages are pages that go through a W3C validation. We will see how we can validate the page and get information about what isn't going through the validation. It's easier if you are a developer or you toke our HTML training. Our most important step is we want to validate our content and we want it to pass the validator. Do you need to validate all pages? In short ideally yes. As our site grows and becomes big we can leverage and use 3rd party tools to help us go through all the pages on our site and validate them.